There is a reason we sail a new Valiant 42, ...a reason why we sailed a Valiant 40 for many years! After 30 years in production, Valiant remains a proven blue water voyager for single-handers and couples. It is amazing that the Valiant 40 was designed in 1973! A very young Robert H. Perry (who just happens to be our good friend "Bob") actually created something really "new" with his modern underbody, long cruising fin keel and skeg-hung rudder. It was a bold departure, almost radical at the time, from the popular heavy displacement designs of the 70s. Indeed, the Valiant became the first "performance cruiser". That performance was quickly demonstrated by the ocean racers of the 80s with the Singlehand Trans-Atlantic races and the BOC Challenge. 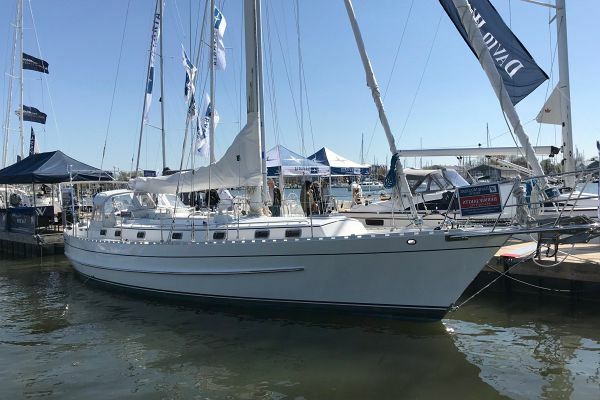 When Mark Schrader set the world record for the fastest circumnavigation beneath all five southern capes, the capabilities of the Valiant 40 were proven beyond doubt. 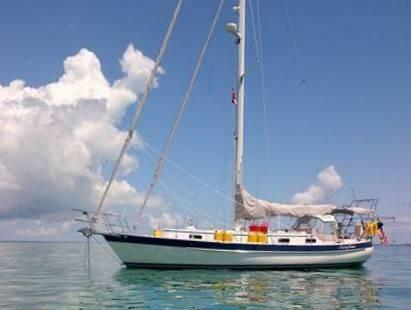 But, what is truly amazing is that this proven ocean racer then became the most desirable choice for a cruising couple or solo sailor. The reason is that the Valiant provides the ultimate combination of strength, stability, performance, safety, and comfort. 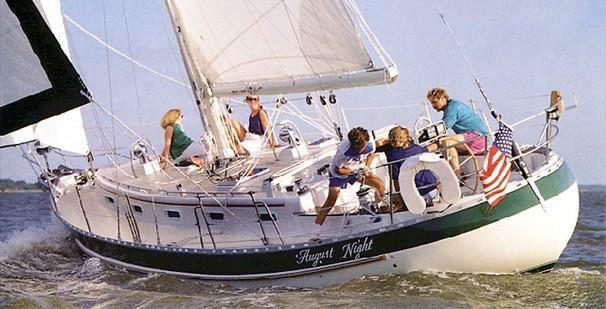 In 1997, the Valiant was recognized with its induction into the American Sailboat Hall of Fame for its contribution as a vessel that has profoundly influenced the sport of sailing and by its sheer excellence, has made sailing better! Call us for specs and pricing details at (954)-527-0664. Valiant builds one of the world’s very best boats. 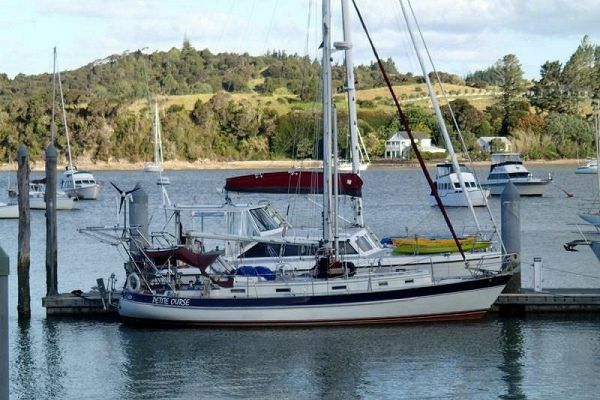 Built like a tank, she is the Nord Haven of sailboats! She is tough and strong. The Valiant Yachts company is absolutely committed to building the strongest and best offshore sailing vessel then can possibly build. There are no compromises! The materials are of the highest quality. The workmanship is superior. The construction and fabrication is all done at Valiant Yachts in Gordonville Texas by a dedicated workforce of skilled, committed professionals. Valiant Yachts has been building Valiant in Texas since 1986 when Rich Worstell rescued the company after the well known blister problem that was due to flame retardant in the resins used by Uniflight. Texas built Valiants have no blister issues. Each Valiant is built by hand, the old fashioned way. The hull is hand laid solid glass and the decks are solid glass in any area where deck hardware will be fitted and cored with balsa and structural foam in other areas. The structural bulkheads, stringers, and furniture is all glassed into the hull. The stainless steel fabrication is of the highest quality. From the hood stainless steel ports to the Lewmar Ocean hatches all of the equipment is of the best quality possible. So many people choose to sail a Valiant because it is the strongest boat they can own. Valiant takes their owners to sea and brings them back safe! It’s a good feeling. We’ll take you to the Valiant Factory and you will have no doubt that this is a quality vessel. You will not find a better boat or a better value. 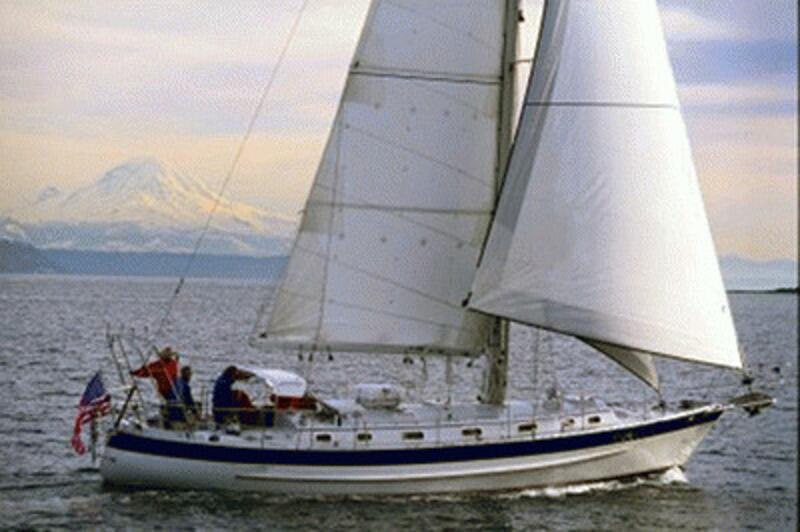 David Walters Yachts specializes in true offshore, ocean going sailing vessels. 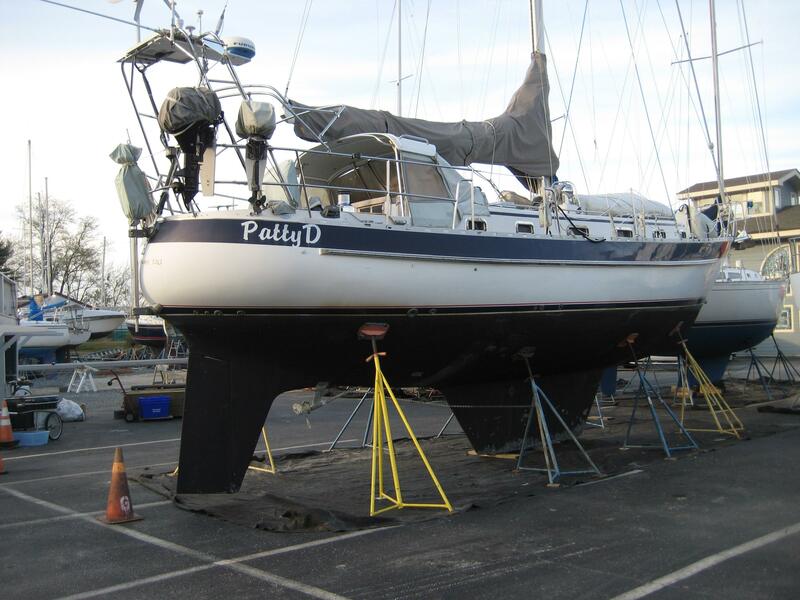 We have taken delivery of a new Valiant 42 as a demo boat that you can inspect and test sail, or even purchase. 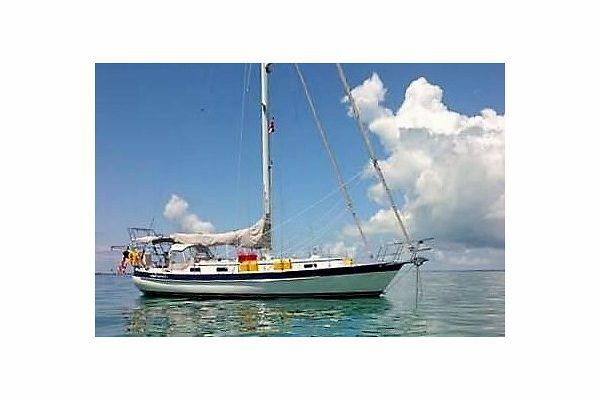 The Valiant 42 is everything a couple needs to sail around the world or just here and there and everywhere in between. The design is magnificent, the construction is bulletproof, the sailing characteristics are phenomenal in light and heavy conditions, you can have every comfort, every safety feature, and all the electronics and equipment that you need for sailing in style. We invite you to come see a Valiant 42 at our docks! 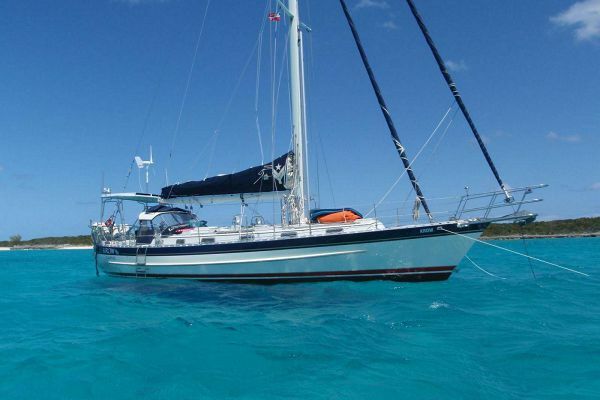 Also, read more detailed specs under our Yachts for Sale section. The Valiant 50 is an amazing powerful aft cockpit two-statement spacious vessel. She is the queen of Valiant’s successful line of performance blue water cruising yachts. Valiant is a semi custom builder providing a choice of layout and many customizations. The Valiant 50 can be built with a centerline queen island birth forward which is desired by many cruising couples. Alternatively, the V50 can have a huge classic V berth cabin, or storage in the forepeake with a large Pullman berth to port. This is a very serious Valiant. The sea trials proved the boat sails extremely well on all points. Our Valiant friends concur after circumnavigation. 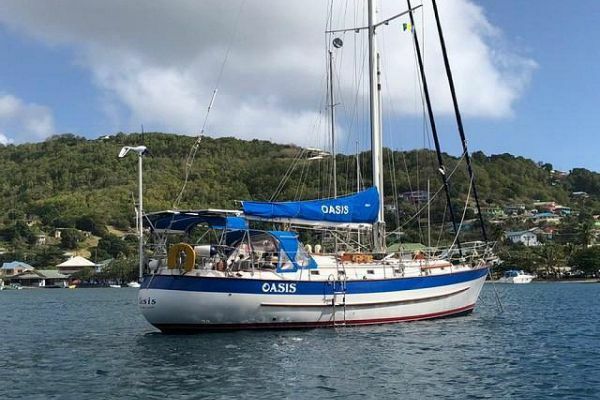 The cutter rig with its manageable sail plan make it easy for a couple to sail in keeping with Valiant's commitment to shorthanded sailing. The Valiant 50 has the same easily driven hull form with its long cruising fin keel and skeg-hung rudder. She is a powerful sailor and tracks effortlessly with a balanced helm. As Valiant's largest and most accommodating yacht, the Valiant 50 is specifically designed to maximize safety, comfort and performance while sailing with a shorthanded crew. See the detailed specs under our Yachts for Sale section. There certainly are not many builders who were able to maintain continuous production for over 35 years! While we were all saddened to see the factory announce that it would no longer produce new Valiants, it is still an incredible achievement. There are many Valiant owners who have owned two of them and few who owned three. Rich Worstel bought the molds and tooling in 1985 after Uniflight had built quite a number of the Valiant 40s between 1973 and 1984. Mr. Worstell was a pilot and he had a perfect location in the middle of Texas on Lake Texoma. A total of 200 Valiant 40s were built and most of them are still circumnavigating. Starting in 1992, the Valiant 40 was replaced with the Valiant 42 and just about 85 were built. The Valiant 47 hull with a retooled deck and interior became the Valiant 50 and 15 were built. In fact the Valiant was built as a 32, 37, 40, and 47; the 37 became a 39, the 40 became the 42, and the 47 became the 50. It was amazing. Mr. Worstell and the Valiant team sure deserve to be very proud. If you buy a Valiant, you will appreciate that the factory is still alive and well and willing to do refits and refurbishment of any Valiants shipped to them. They have a big marina and maintain all the boats on the lake. The parts department still ships Valiant parts anywhere in the world at the very best prices. It is quite reassuring to know that you have hundreds of Valiant owners out there and an active user group. It doesn’t get better than that! The best secret not kept at all is that a used Valiant is a brilliant boat to buy. Valiant is built to go far and many owners equip and maintain their Valiants to do just that. We have lived every inch of this adventure ourselves and we can help you find the very best Valiant you can own. Though our experience of owning a 1991 Valiant 40 and a 2008 Valiant 42 we know just about everything about Valiants. We've sold dozens of Valiants! We've surveyed them, sailed them, and we've even delivered them long distances. Our experience and our passion make us especially capable of helping you buy a used Valiant. We are truly a unique brokerage and consulting firm. 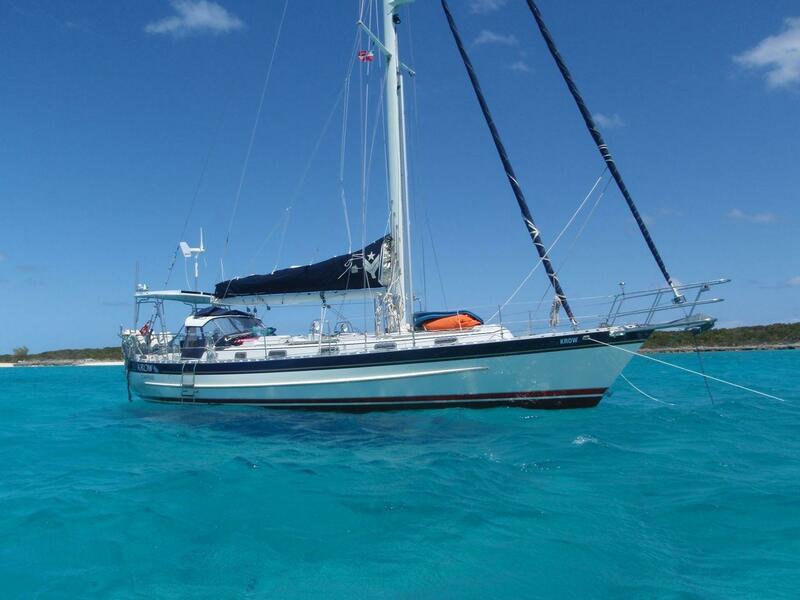 We are standing by to help and advise you as to which boat to buy, how to upgrade her, and how to maintain her. We can help you rig the boat and learn to sail her safely and swiftly. Gosh, we helped friends get through the Panama Canal with their Valiant. 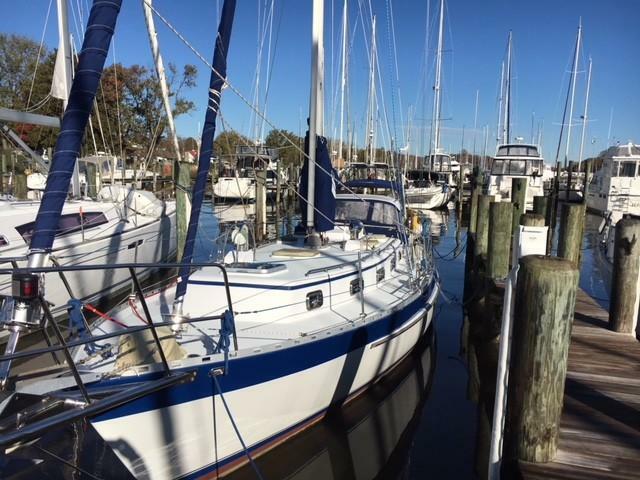 And, Bernie even delivered the V42 Silent Passage from Barrington RI to Norfolk in February to help the new owner get started on his winter adventure. How many Brokers would do that? Crazy. No other yacht brokerage knows and loves these boats as we do. Let us represent you. Gain from our expertise. Let us help you sell your Valiant! We are the very best firm you can choose to work with. 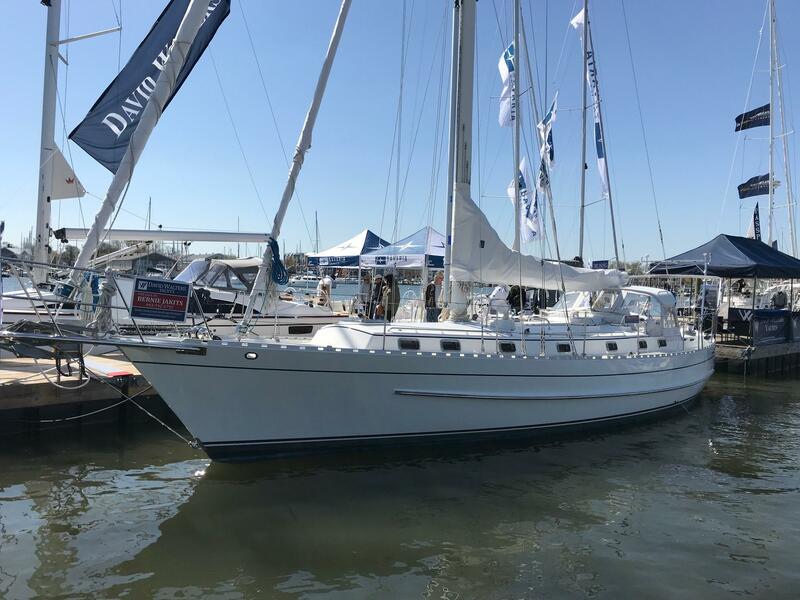 RogueWave Yacht Sales has sold more Valiant 40s and 42s within the last few years, than any other brokerage firm including ALL of the Valiant Dealers put together. For us, it is very personal. We own one! We know Valiants and we love them. We certainly know how to present them to the world and how to get them ready for their next owner. We sell so many Valiants because of our passion and our incredible service and assistance to the new owners. We will sail a Valiant home to just about anywhere! Each and every year we are so pleased to host the Valiant Rendezvous on the water in Luce Creek, behind the home of David Walters Yachts. Luce Creek is a magnificent place with lots of space to raft up in protected waters. In past years, we’ve had a wonderful turnout and great fun. We welcome you all. We've had V32s, V40s, V42s, V47s, and V50. Everyone enjoyed sharing and learning from each other and of course seeing everyone's boat and appreciating all the little nuances of Valiant cultism. We look forward to next Fall! It is always around Boat Show Time in Annapolis either before October 9th or after the Boat Show. October is the best time on the Chesapeake! By land or sea, we hope to have you all show up next year. Email us as we want to hear from you.